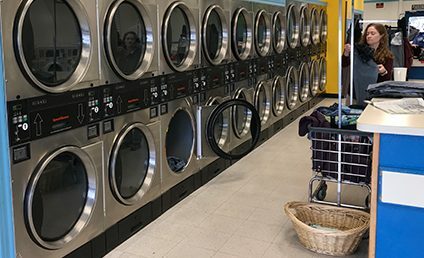 When laundry day comes around, make sure Spin Plus Laundromat is your destination. We’ll make this chore easy for you by providing all of the amenities and equipment you need to get it done right. We strive to give you all of the benefits of high-end cleaning services, at a fraction of the price. Stop in and talk to one of our friendly store managers today about wash and fold or ironing services. *Depending on the current workload of the staff and the load size you bring in occasionally the wash & fold service will have to extend into the next day. Our facilities themselves are maintained to the highest standards. You’re always under the watchful eye of 24-hour security surveillance so you can feel comfortable visiting us day or night. Plus, we have air-conditioned facilities to keep the Texas heat at bay while you’re waiting for your laundry to finish. Everything is clean, well-lit and welcoming. What sets us apart from other facilities with self-serve coin laundry machines in McAllen, TX is that we’re always staffed. Ask questions about our machines, get information about our wash and fold service, or just chat with our staff to make conversation! Stop in today at any of our locations to have a self-service laundry experience that’s worlds above what you might be used to at other facilities! Questions? Give us a call at 956-631-8079.